Amy Freed's The Beard of Avon (2001) lies very much in the shade of Tom Stoppard's screenplay for Shakespeare in Love (1998). It has the premise that Shakespeare, an unlettered, stage-struck country bumpkin, was used as a front or "beard" by Edward De Vere, the debauched but highly cultured 17th Earl of Oxford, for De Vere's own plays. In Stoppard's hands this might have been a dazzlingly witty comedy that also said something about art and representation. In Freed's it is an episodic farce that never explores the richness of its material. The promise of the first hour devolves into a muddle supporting every possible theory of "Who wrote Shakespeare?" while side plots involving Anne Hathaway and Queen Elizabeth lead nowhere. There's lots of fun in the low bawdry, modern lingo back-translated into pseudo-Elizabethan English and the ongoing game of "Spot that Shakespeare Allusion", but little substance. David Storch has efficiently directed the play as a parody of Shakespearean comedy. However, only a handful of the cast of twelve have the requisite style to make the parody trenchant instead of merely silly. Stephen Ouimette is brilliant as the dissolute De Vere, with such a grip on his character he can bring down the house with a single word. Michael Spencer-Davis's finely gradated performance smoothes over Shakespeare's implausibly rapid transformation from illiterate dunce to literary adept. Graeme Somerville maintains a sense of poise as De Vere's effeminate lover and Kevin Dennis is excellent as a boy actor. But the remainder think playing bigger is better, most notably Gina Wilkinson as an overloud Anne and Brenda Robbins as an unqueenly Elizabeth. Peter Hartwell's melding of the stages of the Bluma Appel and Stratford's Festival Theatre is so handsome it should be permanently installed. Susan Benson's stunning costumes combine wit and grace far beyond the author's ken. 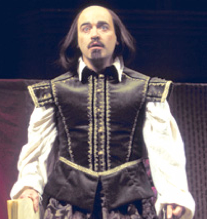 Photo: Michael Spencer-Davis as Shakespeare. ©2002 CanStage.